Beatrix Potter has given the rabbit a special place in the hearts of many people world wide through her exquisite art work and storytelling .She has created endearing characters,not only of rabbits, but also of other familiar animals. 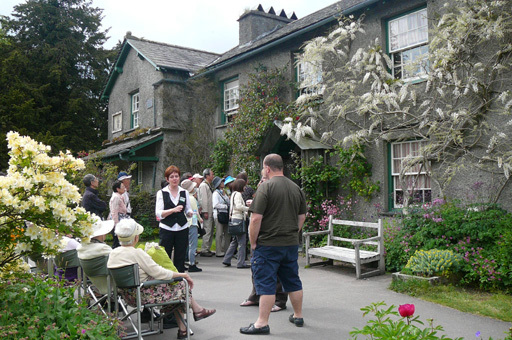 Like the hordes of other fans a visit to Beatrix Potter’s home, her first farm “Hilltop”at Sawrey, in the Lakes District was an absolute must do. Her home was left as if she had just stepped outside. It was cosy, intimate and beautifully preserved. Most of all this was a highlight experience at the end of Spring. 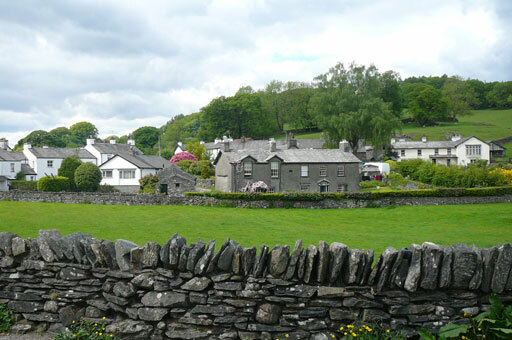 As it was a late Spring the village was still in full flower, and seemed like stepping straight into a picture postcard, or a dream, a time past yet so very present. A Spring that will remain etched in memory and as a inspiration for this lifetime. 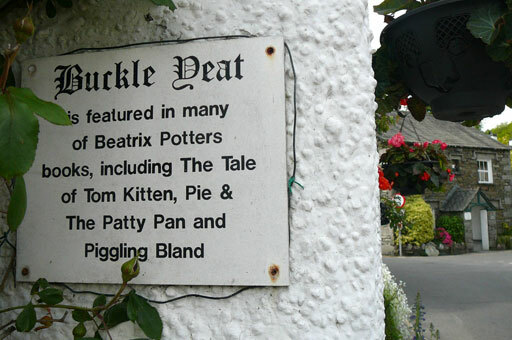 Features that were painted and written about in the Beatrix Potter stories was all here. Stone fences, pretty cottages, green fields ,even Mr. McGregor’s Cottage. 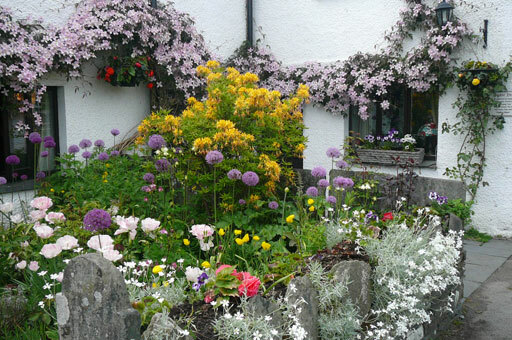 Visiting Sawrey was like the wonder and delight of a forever Spring that has so much loveliness to share. One recent commission is a seasonal piece for Spring. It was a very grounding experience connecting again to the actual southern hemisphere season. Spring is fresh, new, full of promise, beauty and new life. 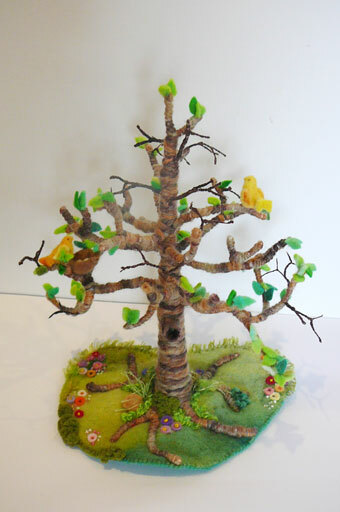 A tree about to burst into leaf, a little bird singing ,a nest with eggs, these tell the story of this perpetual cycle. I am very tempted to include a little rabbit as it is a very ancient Spring Symbol but this work is for Queensland so that might not be appropriate. In this state there are hefty fines for keeping rabbits. As an introduced species it has been accorded pest Status and is an example of what happens when nature is thrown out of balance. 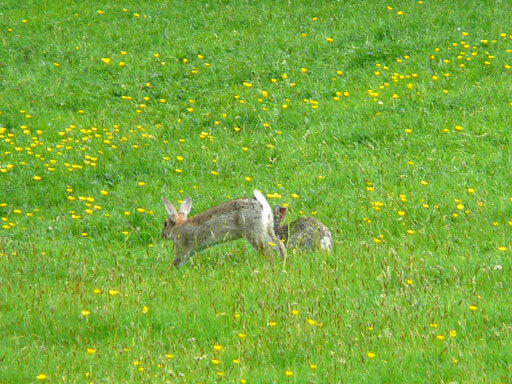 However the Rabbit ,and/or hare is long connected to the celebration of Spring. Many different cultures celebrate this season as a fertility festival predating the Christian Easter. In Europe this was connected to Goddess Ostara or Eostre . Here in the southern hemisphere the period of Easter falls in Autumn. It seems a little strange to be celebrating Spring and new growth when we are preparing to hunker down for winter. Fruits of Summer- How to make a Strawberry mouse . I enjoyed the story of your visit to Beatrix Potter’s home. I’d love to visit it; it’s so charming. Your reflections on the Queensland perspective on rabbits and Easter are very interesting. I’ve never been anywhere in the Southern Hemisphere, and I have a hard time wrapping my head around the differences and similarities with the US. That’s what makes reading blogs from around the world so fascinating. We take rabbits so for granted in the US that my impulse would be to say yes to having one under the sweet tree, but I can certainly understand why it wouldn’t be appropriate. I think it best to leave them out to preserve the serenity of the scene. If not a rabbit, why not a bilby (maybe scene is a bit moist for it) or a little rock wallaby glancing round at the lush grass? I have a problem with the extremely decorative in craft but dreadfully poisonous red spotted beech toadstool in life. To use or not to use! I dread young ones will identify with them being safe to touch. Glad you had such a glorious time OS. I really enjoy reading your missives. They bring a joy to my heart. Keep safe sweets. My, I’m very behind. Hmm, I hadn’t ever consider bunnies being considered too pesky. Here, I plant enough for them and me. Love the tree, and those tiny sweet birds.